The 12-year-old grandson of Egyptian President Hosni Mubarak has died at a hospital in Paris, the state news agency Mena has reported. Muhammad Mubarak died on Monday from complications of a health crisis which lasted two days, Mena said, without giving the exact cause of death. The child's body has been flown back to Egypt for burial later on Tuesday. Muhammad was the president's eldest grandchild, son of Alaa Mubarak, a businessman not involved in politics. Egyptian state TV has been broadcasting religious songs sung by children as a mark of respect to the long-serving president's family. Mr Mubarak's wife, Suzanne, cut short an official visit to London to be at her grandson's bedside. The president will attend the funeral tonight at a military base in Cairo's Nasr City area. The BBC's Christian Fraser in Cairo says the 12-year-old is thought to have had an existing health condition. He was known to be very close to his grandfather. 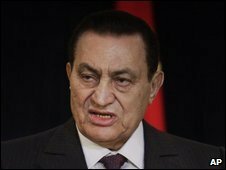 Eighty-one year-old Hosni Mubarak is thought to be grooming his younger son, Gamal, to succeed him as Egypt's head of state.